"I have to follow my heart"
Daron Malakian is well aware that his new band, Scars On Broadway, might at first rub System Of A Down's millions of fans the wrong way. "I know System has tons of loyal fans," the guitarist says, "and I'm very grateful to have them. I wouldn't be in the position I'm in if it weren't for them. But still, I have to follow my heart, my muse, as cheesy as that sounds. And right now my heart is fully involved in Scars On Broadway." Malakian formed Scars On Broadway in 2006 with System drummer John Dolmayan, and their just-released, self-titled debut is one of the year's freshest surprises. Gone are the herky-jerk time changes and overt politics; the new album is a hook-filled, straight-forward, song-oriented effort. 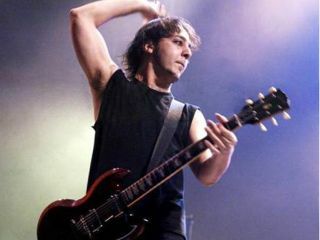 Malakian sings on all the cuts, on which he channels his love for bands such as The Beatles,The Kinks, and artists like Neil Young and Brian Eno. "People are always surprised to hear the music I'm really into," Malakian says, laughing. "But I think an artist has to expose himself to everything that's around him, and who better to learn from than the masters?" Regarding System Of A Down's protracted period of inactivity, Malakian refers to it as a "separation." He is reticent to say that the group has broken up - the door is open, he says, but it might not be one he steps through anytime soon. "System could get back together," he says, "but I think it might be a while. To be honest, I expect to put out another Scars On Broadway album before a System record." Before hitting the road with Scars (the touring band is rounded out by guitarist Franky Perez, keyboardist Danny Shamoun and bassist Dominic Cifarelli), Malakian sat down with MusicRadar to discuss the new album, the status of System Of A Down, and what makes his musical mind tick. And he happily answered a bunch of your questions too.